Our Vision is guided by the ethos of the Presentation Sisters and the Christian Brothers. The characteristic spirit of the school is based on a Christian education in a catholic tradition. In Coláiste Íosagáin we endeavour to provide an education for the whole person, where respect and care for all are central values, enabling each one to achieve their own potential. In line with our Mission Statement we endeavour to create an ethos which will enable the boys and girls entrusted to our care to develop in an atmosphere of mutual trust and respect. We encourage our students to become involved in the life of the school and their local community. We strive to be constantly aware of the dignity of each person. We try to show gentleness, courtesy and consideration for each other at all times. We acknowledge the individuality of each person and we try to show tolerance and compassion in our dealings with each other. We recognise the need to grow ourselves in order that we can help our pupils to grow in their personal development. We recognise that the curriculum of the school must be sufficiently wide and flexible to give all pupils (including those who are disadvantaged), clear educational goals and opportunities to achieve success-each to the level of their own ability. We strive to build a sense of community based on Christian values. The first convent primary school opened on 16th October 1854 with six students. There were classes in catechism for boys and girls in the evenings. The first primary school was officially opened in 1856 with 100 students. In 1862, 1868 and 1906 extensions were added. There was growth towards second level education from 1859 onwards. In 1916 there was a large centre for the King’s Scholarship Exam at Easter with 80 candidates. The secondary top grew significantly from 1939 onwards. In 1962 a new section was added to the Primary school, across the road from the main building. In the late 1960’s many pre-fabs were added to the secondary school. Work began towards the building of a new secondary school in 1977. The first Board of Management to Scoil Mhuire was appointed in 1987. In the late 1990’s an amalgamation was agreed between Scoil Mhuire and the Christian Brothers Secondary School. 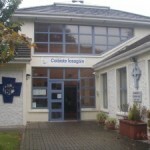 Coláiste Íosagáin, under joint trusteeship of the Presentation Sisters and the Christian Brothers was opened on 1st August 2001 under the principal-ship of Seamus Bennett. In 2006 the Presentation Sisters became the sole trustee by agreement with the Christian Brothers. In 2001, St. John’s vocational school closed and the students transferred to Coláiste Íosagáin. This is now the only second-level school in the catchment area. Coláiste Íosagáin is now under the trusteeship of CEIST.